Bengaluru: Mumbai-based real estate developer Orbit Corp. Ltd has a portfolio of premium real estate projects in south and central Mumbai. In the past two years, the developer’s sales have dwindled as potential homebuyers stayed away and waited for the economy to overcome its worst downturn in a decade. For Orbit, which is struggling to repay creditors, delayed project approvals and changes in local building regulations have made the situation worse. “After a really slow period, we are hoping that the government will help real estate firms in getting projects off the ground with speedy approvals. Orbit has got fresh approvals for some of its projects, and is expecting to re-launch a few of them soon," managing director Pujit Aggarwal said. The real estate market has been among the sectors worst hit by the economic downturn which, coupled with high interest rates in the face of persistent inflation and delays in securing mandatory government approvals, has kept wary homebuyers away for the last couple of years. Debt-laden developers in the country’s key property markets—Mumbai, Bengaluru, Chennai and the National Capital Region (NCR centred on Delhi)—have been struggling with slow sales, high unsold inventory, delayed construction and stalled projects. There are no signs, yet, of things getting better. For instance, in January-June, the Mumbai metropolitan region recorded its worst home sales and project launches since the global financial crisis of 2008, according to a report by the property advisory Knight Frank India Pvt. Ltd released this week. Home sales dipped 9% to 28,446 units and new launches dropped 47% to 18,887 units, it said. The country’s largest property market, NCR, saw a pile-up of inventory in the January-March period that would take close to 78 months to clear at the current pace of sales, according to property consulting firm Liases Foras Real Estate Rating and Research Pvt. Ltd. 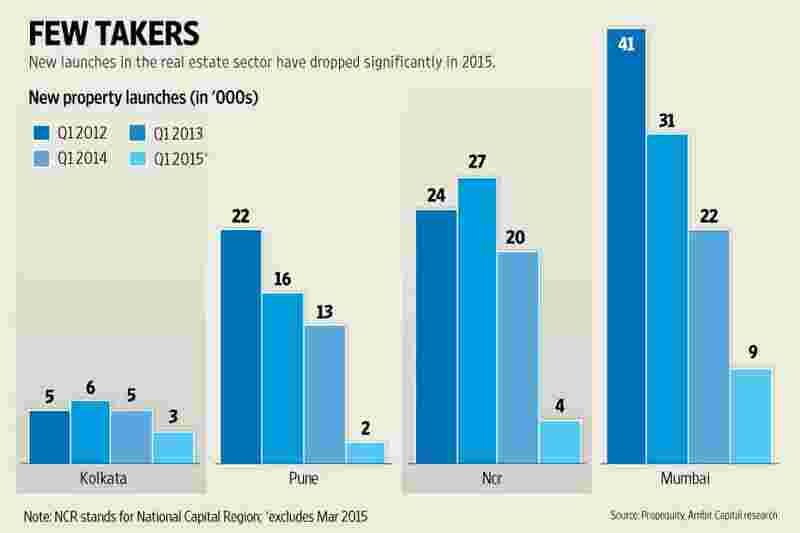 Unsold inventory in NCR in January-March rose 12.63% to 235,908 apartments from a year ago. Following the collapse of Lehman Brothers Holdings Inc. in September 2008 and the ensuing global financial crisis that froze credit markets, India’s property market went into a tailspin. Yet, by late 2009, the sector started getting back on its feet. This time around, the slump has endured a lot longer. More importantly, if an acute liquidity crunch was the big worry in the aftermath of the 2008 crisis, now it’s buyer sentiment—many potential homeowners simply don’t want to get into the market. “The big difference between the two slowdown cycles of then and now is that today, it is a buyers’ sentiment issue. Developers have more access to different sources of capital now but customers just don’t want to buy," said Ashwinder Raj Singh, chief executive of residential services at the Indian arm of property advisory Jones Lang LaSalle Inc. Customer behaviour has changed in the last few years, said Singh, with buyers having lost confidence in a developer’s ability to construct and deliver a project on time. “A developer’s biggest challenge is to regain that lost faith and win the confidence of homebuyers," he said. The loss of faith isn’t an overnight phenomenon. It has taken place over a period of time. Developers in the past have launched massive townships and projects by the dozen, and often times used customer advances to buy land or launch other projects, delaying construction by months and even years. India’s residential market can be broadly divided into three—Delhi-NCR and Mumbai that have borne the brunt of the downturn; Bengaluru and Pune, where sales have slowed but end-user participation is still higher than in other cities; and third, so-called tier-II or small cities and towns where it is dominated by regional developers with little or no national presence. NCR, where developers have always been dependent on investors (as opposed to end-users) to buy residential stock, suddenly came to a standstill as such buyers fled, spooked by stagnant property prices and incomplete projects. Genuine homebuyers remained deeply suspicious. “NCR has certain systemic issues because the market is built on speculative ground and the basic financial and execution discipline required by a developer is absent. The only trigger that will get NCR back on its feet is execution and delivery," said Jasmeet Chhabria, managing partner, ARGIL Advisors LLP, an affiliate of Religare Global Asset Management. Even deep discounts, easy payment plans and freebies haven’t been able to turn around consumer sentiment in NCR. The inventory of completed-yet-unsold units has reduced from 3,094 units a year ago. Still, buyers are taking their own time to make a purchase decision and one of the main reasons is pricing—most of these 2,600 units are priced above ₹ 1 crore—a price that’s above the reach of most middle-class buyers. Visits to five property registration offices in Mumbai suggest a sharp drop in the registration of new residential properties and data from property valuers in Maharashtra and Tamil Nadu suggest transaction volumes have fallen 10-15% per annum for three consecutive years now, said a July report by Ambit Capital Pvt. Ltd.
“The recovery of the residential market (in Mumbai) does not seem imminent until 2015 and we expect sales to be in the range of 63,000 units, which is marginally below the 2014 levels," said Samantak Das, chief economist and national director, research, Knight Frank India. Property prices in most big cities will likely fall, the report indicates. Reserve Bank of India (RBI) data suggests the banking system seems to have turned the tap off for property developers over the past year. This has, in turn, made developers either stop construction or cut prices. “Whilst the RBI’s Housing Price Index suggests prices have moderated on a pan-India basis, data from property websites suggests a deeper slowdown in India’s large cities, with prices falling by 7-18% year-on-year," it said. In Mumbai, India’s most expensive property market, prices have started softening after several months of tepid sales, holding out hope that buyers may return. Although prices are still high in Mumbai, its developers are more financially prudent than those in NCR, said Chhabria. “If prices come down by 10%, sales will happen in Mumbai," he said. Bengaluru, which has been resilient so far and was the best performing market both in residential and commercial office space, has also seen home sales slowing in the last couple of quarters. “Bangaluru may have done better than the rest, but sales are quite muted now. Fortunately, sales in luxury projects in which homes are priced between ₹ 5 crore to ₹ 10 crore each, which were quite slow, have seen a slight pick-up in the last quarter ," said Nitesh Shetty, chairman of the eponymous Nitesh Estates Ltd.
Amid all the doom and gloom stories, there have been some outliers by the dint of efficient project execution. At a time when most developers have struggled to sell residences, Mumbai’s Lodha Developers Pvt. Ltd clocked record residential sales of ₹ 7,800 crore in the year ended 31 March. Bengaluru’s Prestige Estates Projects Ltd generated about ₹ 5,030 crore of sales. Lodha has around 19 projects in Mumbai, including a number of high-end properties and its ambitious project Palava—which is spread across 4,500 acres and has 12,000 people living in it. “This (sales) was a result of our strategy to focus on high-quality housing and office space across segments. We are focused on ensuring that FY16 is a record year, targeting sales of ₹ 10,000 crore and the delivery of almost 7,000 units," said a Lodha spokesperson in an emailed response. “Since 2010 or 2011, there has been a significant demand for quality. Developers who display credibility and the ability to deliver quality are sought after. They are not facing as much the problem of unsold inventory." Lodha recently conducted an initial public offering-style pre-launch for a project on an 88-acre land parcel in Thane, in peripheral Mumbai, and said it received around 2,500 applications from potential customers. To be sure, Lodha is an outlier in a sector where poor residential sales over a long period have battered the balance sheets of top developers, who are looking at strategies to lower debt and generate cash flows. 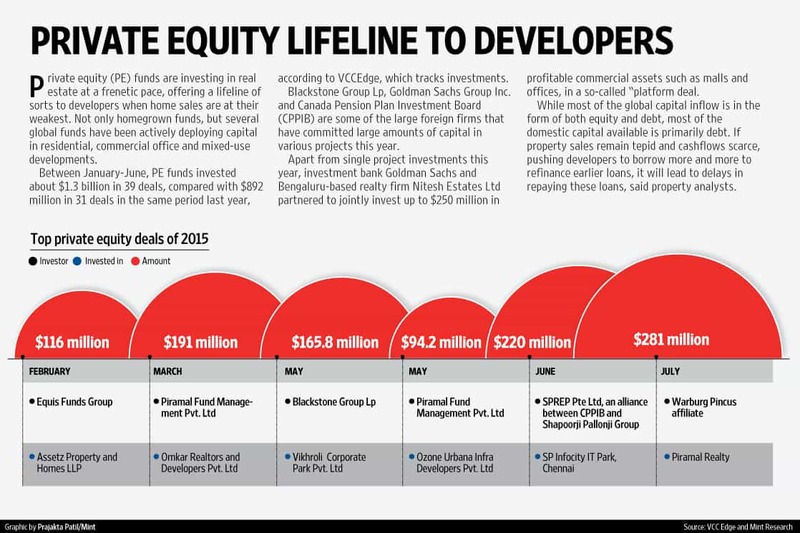 Debt levels peaked at many realty firms, including DLF Ltd, India’s largest developer by market value, forcing them to sell non-core assets, exit businesses and strike joint venture deals with other developers to bring down capital expenditure on projects. Repayment of debt hasn’t been easy as cash flows from project sales have remained under strain and developers have been forced to borrow more, in some case, to repay earlier loans. The top 10 real estate firms by market capitalization had a total net debt of ₹ 45,723 crore as on 31 March. In June, DLF sold its multiplex business DT Cinemas to movie exhibitor PVR Ltd for ₹ 500 crore. The company said it will use the money to lower debt, which rose by ₹ 628 crore to ₹ 20,965 crore in the March quarter from the preceding three months. After going without a new launch for nearly a year, DLF has announced a few select projects recently and received good response. The challenge for DLF will be to reduce debt while generating cash flows and improving project execution, said a property consultant. To be sure, there’s no dearth of demand for housing in a country of 1.25 billion people. The shortage of urban houses stood at 18.8 million units in 2012, and it is expected to grow at a compounded annual growth rate of 6.6% for 10 years till 2022, when it will reach 34.1 million, according to a report by the research and consulting firm RNCOS and cited by the Press Trust of India. Rising inventory levels in a country where housing shortage is such a critical issue indicates that the supply that is available is unaffordable to many, according to property consultants. Mumbai has a shortage of 2 million homes, but is unable to sell half its inventory pile-up because of unaffordable prices. “This means that sales can improve but at the right price. NCR, on the other hand, doesn’t have a price problem but 52% of the housing supply is in uninhabitable areas which doesn’t have adequate infrastructure for people to actually go and live," said Pankaj Kapoor, managing director, Liases Foras. The National Democratic Alliance government led by Prime Minister Narendra Modi is trying to do something about reducing the shortage and improving affordability. In June, Modi launched three government schemes—the Smart Cities mission, Atal Mission for Rejuvenation and Urban Transformation (AMRUT) and Housing for All mission at an expected cost of around ₹ 4 trillion. The Housing for All scheme aims to provide at least 20 million homes to lower-income earners. These apart, a real estate bill that is aimed at primarily protecting consumer rights is also waiting to be cleared. The real estate sector, meanwhile, seems to be in a transition stage, where it is gradually moving from an investor-driven to an end-user-driven cycle. Interest rates are slowly coming down and affordability will improve. Over the next year, it is expected that developers will hasten the pace of construction and will focus on execution of existing projects rather than go ahead and pre-launch multiple projects to generate cashflows. “Once the projects near completion and get ready for possession, customer confidence will increase. It will help boost sales momentum because many customers, who earlier bought at a pre-launch stage, now feel betrayed that developers didn’t bother to complete those projects on time," said JLL’s Singh. India’s commercial office sector remains steady with firms taking up new and additional offices amid increased supply, in sharp contrast to the residential slowdown in the real estate sector. A boom in the e-commerce sector has led to a spurt in office space leasing, as online retail firms such as Amazon.com Inc., Flipkart Ltd and Snapdeal.com committed to large spaces, particularly in the National Capital Region (NCR) and Bengaluru, said property consultants. In the April-June quarter, e-commerce emerged as the second largest occupier of office space with a share of about 17%, followed by banking and financial services at 16%, said a July report by property advisory CBRE India. With a share of about 36%, the information technology (IT) and IT-enabled services (ITES) sectors remained the largest occupier of office space across the seven leading cities. Overall leasing rebounded in June quarter with more than 8 million sq. ft of office space absorbed across seven leading cities, of which close to 35% was absorbed in Bengaluru alone. “We are planning about ₹ 3,000 crore of capital expenditure in three years and plan to deliver 13 million sq. ft in the same time," said Mike Holland, chief executive, Embassy Office Parks. Blackstone Group Lp-backed Embassy has inked a leasing transaction with Flipkart for 2 million sq. ft of space in Embassy Tech Village on Outer Ring Road, Bengaluru. A clutch of developers such as DLF Ltd and Embassy-Blackstone are slowly getting ready for a possible real estate investment trust (REIT) listing, once the finance ministry clears taxation hurdles. A REIT listing will allow developers an opportunity to monetize commercial assets and generate liquidity. “REITs will completely transform the office sector, improve transparency and attract more investments," said Raja Seetharaman, co-founder, Propstack, a start-up that offers information on commercial real estate.